There are a few unavoidable expenses in life and if you are going to be driving a motor vehicle in New Jersey, automobile insurance is one of them. If you are pulled over by the police and caught driving without insurance, you can face serious charges and significant fines. 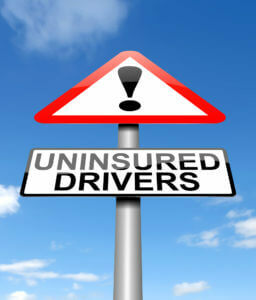 Individuals who drive with no insurance are known as “uninsured motorists.” In New Jersey, this offense is treated seriously because uninsured motorists drive up the cost of insurance for others significantly and create a safety, financial, and legal liability for other drivers on the road. Whether you are driving without insurance in New Jersey because you could not afford to get car insurance, you forgot to get a policy, you were driving someone else’s uninsured car, you thought it was unnecessary, your insurance expired without your knowledge, or any other reason, you may be stopped and charged with a violation of N.J.S.A. 39:6B-2. When you find yourself facing driving without insurance charges, it is time to call a lawyer with the knowledge and experience to best defend you in court. Our highly experienced defense attorneys have a depth of knowledge and practical skill when it comes to defending clients charged with criminal and traffic offenses in New Jersey. Partner William C. Fay has maintained an impeccable reputation among his colleagues and most importantly, his clients, for years. To find out more about what you’re facing when charged with operating a motor vehicle uninsured in New Jersey and what you can do to protect yourself, contact our local office today at 609-832-3202. We will provide you with a free consultation and discuss your legal options when appearing in courts throughout the area. Don’t delay in finding the answers you need. Under N.J.S.A. 39:6B-2, if you are the owner or registrant of a vehicle who is required to carry automotive liability insurance and you operate the vehicle without such insurance, you may be charged with driving without insurance. You can also be charged with this offense even if you are not the owner or registrant, if you drive the vehicle and know, or should have known, that the vehicle was uninsured. If you are pulled over by the police and you are unable to provide proof of insurance when they request it from you, there is a rebuttable presumption that you are uninsured at that time. That means that it will be up to you to prove that you did in fact have a policy or you may be found guilty of driving without insurance. The penalties for driving without insurance in New Jersey increase with each subsequent offense. If you are a first time offender and you are found guilty, you will face mandatory license suspension. You will also face a fine of $300 to $1,000, as well as additional DMV and court fees, and be ordered to serve community service. Second time offenders convicted of driving uninsured face more significant punishments, including a mandatory prison sentence of 14 days, license suspension for 2 years, and fines of up to $5,000. As you can see, a charge for driving without insurance is not something to be taken lightly, as it can result in mandatory license suspension and even imprisonment if this is your second offense. However, a charge for driving without insurance does not mean you will definitely be convicted. An experienced traffic defense lawyer in New Jersey can strategize and argue defenses on your behalf to help you avoid a conviction. These defenses may include that you did not know the car was uninsured and had no reason to know, or that the vehicle was registered in another state and was not principally garaged in New Jersey. Contact the skilled attorneys at our firm today at 609-832-3202 for a complete review of your case to determine your best strategy moving forward. Consultations are always provided free of charge.